Our fans and motors have demonstrated outstanding reliability and durability over a 50-year period. This wealth of experience contributes to the exceptionally rugged performance of our products, each one built to railroad and NEMA standards. Since we build all sub-assemblies ourselves and closely control the quality of every component, all our commutators are custom built to your particular motor's specifications. Every motor is built in-house by hand because of their complexity and the need to meet close dimensional tolerances. All motors incorporate a heavy rolled steel frame that is custom fabricated, ground and polished to provide excellent structural integrity. Because of the high stress and temperatures of their operating environment, Class H insulation materials are used and the frame and coil are varnish-dipped and baked as a unit for increased structural rigidity. Zinc-plated hardware is used to eliminate corrosion. Dayton-Phoenix Grid Blower Fans are dynamically balanced to provide high speed performance that is smooth and virtually vibration-free. The unit's rugged tenon offers a positive mounting surface to assist proper piloting to reduce vibration and wear. All motors are performance tested under load and undergo vibration analysis prior to shipping. 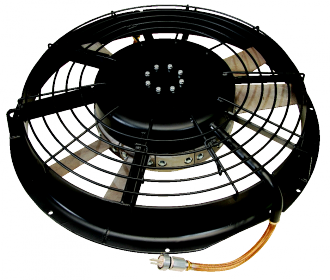 Dayton-Phoenix manufactures a wide variety of radiator cooling motors (stator packs) and complete fans. One- or two-speed models are supplied in either 200 Volt or 400 Volt designs, operating at up to 120 Hz and 46 HP. Low profile designs are also available. Both quiet and conventional fan designs incorporate our unique inside-out motors. These special motors provide more horsepower in a smaller package than commercially designed motors, allowing for better air flow and easier installation. Forty-eight inch fans are standard. All Dayton-Phoenix designs meet or exceed major railroad OEM performance and reliability specifications. Our motor and fan components are specifically designed to withstand torque changes and multiple starts. Class H insulation is used to protect the motor from the heat generated by multiple starts. End turns are laced and tied down, and a process of multiple bakes and varnishes is used to prevent premature motor failure and ensure motor longevity. Specifically designed motor bearing support systems, utilizing shielded bearings and high temperature grease, ensure proper lubrication to withstand high temperature operation for long life. Components are manufactured to extremely tight tolerances and maintain maximum dimensional stability for optimum performance and operation efficiency in extreme high and low temperature environments. Our manufacturing expertise and fan assembly technology enable us to provide high quality radiator cooling motors and fans with greater dimensional accuracy and fast delivery to better serve your needs. If you are planning to upgrade locomotives, this product can be built to your specifications incorporating the latest technology. Product Listing for "48" Fan Assemblies" category.